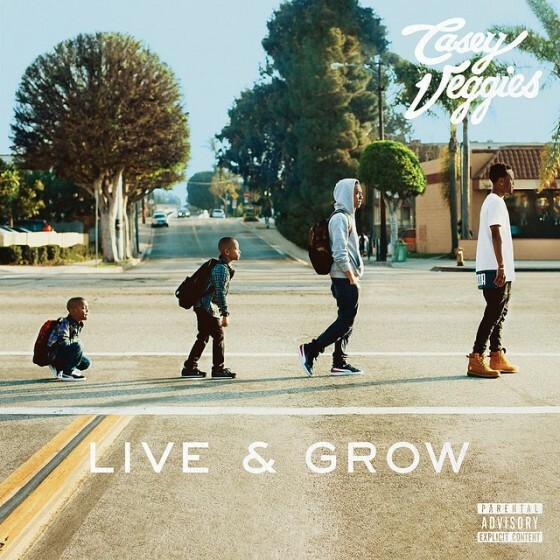 Casey Veggies was geared for a breakthrough in 2015. Five mixtapes strong into his career, Veggies’ work finally culminates into his new album Live & Grow. Veggies uses the album as a way to represent his growth in the industry. Veggies is tossing away the persona he onced carried as a member of Odd Future, and is now shooting for more of a mature image. “Actin’ Up” brings a new style to the album. The beat comes off as atmospheric with hints of bass thrown down alongside the twinkles of the synths. The song bounces to the beat as Dom Kennedy and Veggies bring the heat. “Backflip” shows the strength of the featured rappers on the album. YG feels like he’s in charge as his bars are better than Veggies on the track. IAMSU! plays a great support role on the track with his modulated voice on the hook. The production is light with a drum beat and synths mixed together. “Life Song” is a slow paced jam. The deep bass is sprinkled across a light synth to match the slow paced rap BJ the Chicago Kid’s hook is reminiscent to a jazz singer; smooth but with little changes in pitch throughout. The track features some of Veggies better lines which makes it feel like he is not being pushed to the side. Live & Grow is a testament to the growth that Veggies has gone through over the course of his career. Far from his adolescence days with Odd Future, Veggies is more focused on his own solo career. We get a mixture of both good and bad through the tracklist. For Veggies, Live & Grow serves as a starting point to a new part of his career and style.